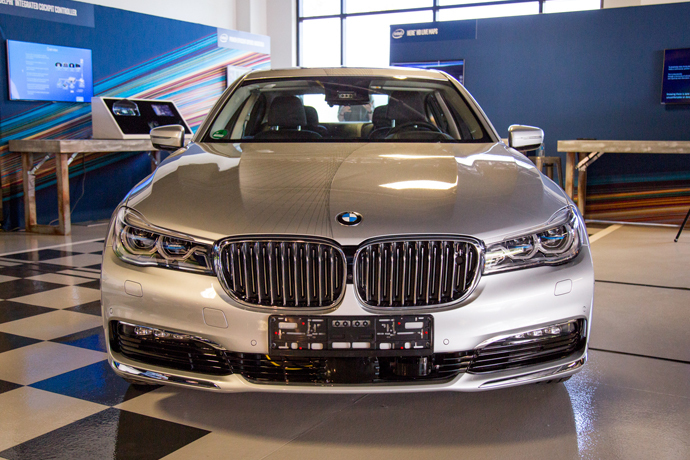 Munich, May 16, 2017 – The BMW Group, Intel and Mobileye (“Cooperation Partners”) announce their intention to onboard Delphi as a development partner and system integrator for their state-of-the-art autonomous driving platform. The four partners intend to jointly deploy a cooperation model to deliver and scale the developed solutions to the broader OEM automotive industry and potentially other industries. Delphi has already provided a prototype compute platform to the BMW Group and is working together with Intel and Mobileye in the areas of perception, sensor fusion and high performance automated driving computing. In July 2016, the BMW Group, Intel, and Mobileye announced that they are joining forces to make self-driving vehicles become a reality and are collaborating to bring solutions for highly and fully automated driving into series production by 2021. The Cooperation Partners have since developed a scalable architecture that can be adopted by other automotive developers and carmakers to pursue state-of-the-art designs and create differentiated brands. System integrators, such as Delphi, are critical for the go-to-market strategy of the joint solution to reach multiple automotive OEMs quickly. A key role for Delphi will be the integration of the solution delivered by BMW Group, Intel and Mobileye into OEM vehicle architectures. Additionally, Delphi may also provide required hardware components such as sensors as well as specific customization efforts and applications for differentiation. Mobileye N.V. is the global leader in the development of computer vision and machine learning, data analysis, localization and mapping for Advanced Driver Assistance Systems and autonomous driving. Our technology keeps passengers safer on the roads, reduces the risks of traffic accidents, saves lives and has the potential to revolutionize the driving experience by enabling autonomous driving. Our proprietary software algorithms and EyeQ® chips perform detailed interpretations of the visual field in order to anticipate possible collisions with other vehicles, pedestrians, cyclists, animals, debris and other obstacles. Mobileye’s products are also able to detect roadway markings such as lanes, road boundaries, barriers and similar items; identify and read traffic signs, directional signs and traffic lights; create a RoadBook™ of localized drivable paths and visual landmarks using REM™; and provide mapping for autonomous driving. Our products are or will be integrated into car models from more than 25 global automakers. Our products are also available in the aftermarket. Delphi Automotive PLC (NYSE: DLPH) is a high-technology company that integrates safer, greener and more connected solutions for the automotive and transportation sectors. Headquartered in Gillingham, U.K., Delphi operates technical centers, manufacturing sites and customer support services in 46 countries.